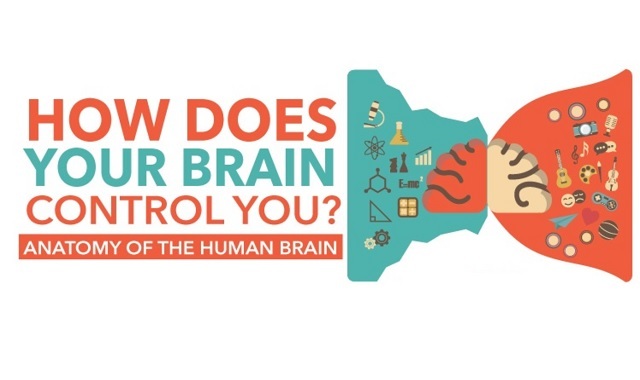 How Does Your Brain Control You? #infographic ~ Visualistan '+g+"
A complex and little-understood organ, the brain is a marvel of human physiology. There are eight main ‘sections’ of the brain that control everything about you, from the way you react to stimuli across all your senses. Your brain also makes ‘you’, for example, what you remember and when. It also determines other characteristics of your personality. And the richness of the brain and its functions means that there are no two people on earth that are exactly the same. Your brain also controls your nervous system, sending messages along the nerves that act as highways around your body that carry the message from your brain to all of its major organs. Your brain tells your muscles when to contract and relax; it tells your body when to stand or sit. As well as these kinds of actions, it also regulates how well your major organs work. For example, it will tell your heart to beat faster if you need a surge of energy to walk faster or run.